Whether fueled by wood or coal, steam technology powered the industrial revolution. In our Age of Steam Gallery visitors can view some examples of steam engines from Nova Scotia and see how they were used. The Davies engine, made in Pictou, is effectively two linked steam engines. It was used to haul boats. 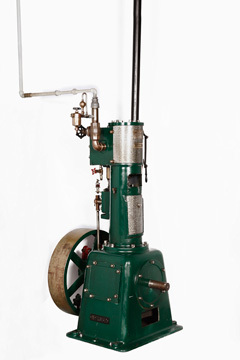 Made by Robb Engineering of Amherst, it is a vertical steam engine that was used in a manufacturing plant in the United States. In the Machine Shop there are a series of machines linked to single engine by a series of belts and pulleys linked to a common drive shaft. This was a common set up in industrial workplaces and allowed a whole room full of equipment to be run from a single power source.